Public reporting of outcomes and quality in cardiac surgery is part of a national effort to improve performance and accountability in healthcare. There have been pioneering efforts to justly tabulate and report clinical risk-adjusted data with much experience gained over the last decade. We are now on the threshold of national public reporting in congenital heart surgery. 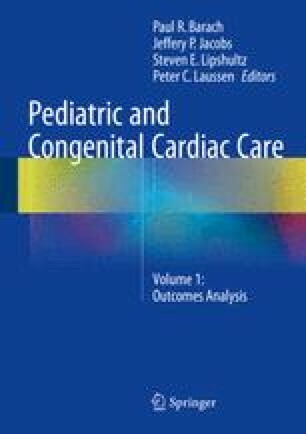 Our objective is to outline the foundation for public reporting of cardiac surgical outcomes and describe the recent progress and future direction for public reporting of pediatric cardiac data. Kennedy I. Learning from Bristol: the report of the public inquiry into children’s heart surgery at the Bristol Royal Infirmary 1984–1995. http://www.bristol-inquiry.org.uk/. Accessed 21 May 2005. Sherry A. Children’s Hospital cardiology chief told to resign. Denver Post. Article Published: 1 Mar 2001. http://www.denverpost.com/news/news0301b.htm. Accessed 21 Mar 2001. Sherry A. Hospitals shield mortality rates. Denver Post. Article Published: 2 Mar 2001. http://www.denverpost.com/news/news0302d.htm. Accessed 21 Mar 2001. The Denver Post Editorial Board. At the heart of the problem. Denver Post. Article Published: 2 Mar 2001. http://www.denverpost.com/opinion/edits0302c.htm. Accessed 21 Mar 2001. Hernandez J. Other options. Denver Post. Article Published: 3 Mar 2001. http://www.denverpost.com/opinion/lett0311.htm. Accessed 21 Mar 2001. Johnson L. Baby’s death at Children’s turns parents to their faith. Denver Post. Article Published: 3 Mar 2001. http://www.denverpost.com/opinion/lett0311.htm. Accessed 21 Mar 2001. White S. Kids’ best interests: re: “Children’s Hospital cardiology chief told to resign,” March 1. Denver Post. Article Published: 3 Mar 2001. http://www.denverpost.com/opinion/lett0311.htm. Accessed 21 Mar 2001. Weinberg S. Rare look inside a surgeon’s sanctum. Denver Post. Article Published: Sunday, 20 Apr 2003. http://www.denverpost.com/Stories/0%2C1413%2C36, 28, 1333663%2C00.html. Accessed 22 Oct 2004. The report of the Manitoba Pediatric Cardiac Surgery Inquest: an inquest into twelve deaths at the Winnipeg Health Sciences Centre in 1994. Available at: http://www.pediatriccardiacinquest.mb.ca/pdf/pcir_intro.pdf. Accessed 12 June 2014. Hudson W, Cohen E. After CNN investigates babies’ deaths, hospital releases mortality data [http://edition.cnn.com/2013/08/12/health/kentucky-children-update/index.html]. Accessed 6 Nov 2013.